Place oven rack to highest position and preheat the broiler. In a small bowl combine the mustards and set aside. Butter 1 side of each slice of bread with the butter. Place on a baking sheet. Broil until the bread begins to brown, about 2 minutes. Remove from the oven and spread the mustard mixture evenly over the toasted bread. Then spread the apple butter evenly over the mustard. 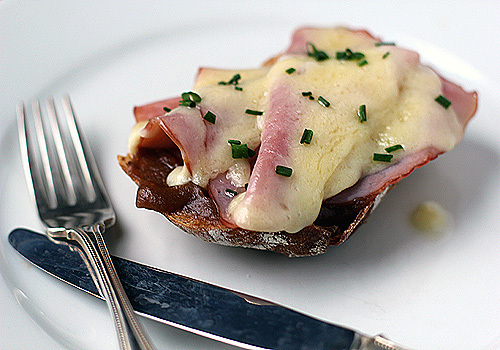 Layer the ham and the top with the cheese slices. Return the baking sheet to the oven and broil until the cheese melts and begins to brown in some spots, about 2 minutes. Remove from the oven and sprinkle with chives. Serve immediately. Enjoy! Interesting recipe. It looks delicious and I can imagine how the flavors would blend well together.if you wont mind, I'd love to guide Foodista readers to this post. Just add the apple butter widget at the end of this post and it's good to go. Thanks! We are having our FIRST frosty Fall morning here in Florida. This is my favorite time of year and I was looking for a special "cozy" breakfast treat to go with our European coffee we like. This recipe is delicious (especially since I had left over aged Cabot cheddar you recommended from your mac n' cheese!) My husband and I loved this! Even my 3 yr old daughter said, "YUM!!!" Thanks making my perfect Fall morning even better! I am so glad you and your family enjoyed it! George and I had it for lunch today and it was delicious! I served with a bowl of tomato soup also garnished with some sipped chives. Perfect for a Sunday lunch on a cold day. I am so glad you enjoyed it! Now you have me wanting to whip up a batch of tomato soup. Yum! this is such a great idea! to put something sweet in a savory sandwich. i just spread apricot preserves w/ dijon mustard on my turkey paninis. soo yummy!